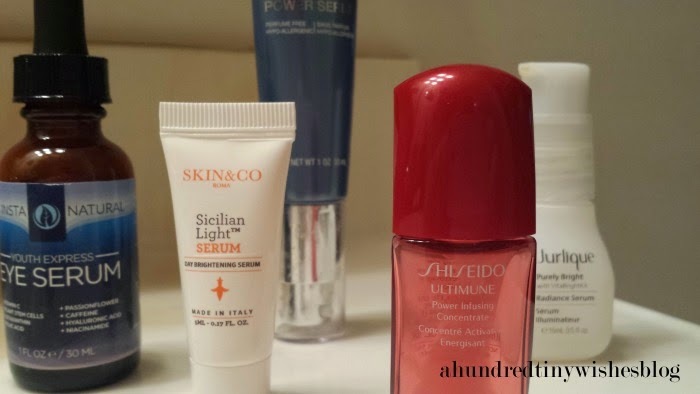 I was first introduced to the world of serums through Birchbox- my monthly sample box. And I was hooked at first try. Serums have become increasing popular over the last few years, but until recently no one actually knew what they were. And they were usually sold within the high end brands. If you don't know what I'm talking about, then today I am here to explain what facial serums are, how to use them, why you should add them to your beauty routine, where to get them, and which ones I have tried & loved. Serums are more concentrated then the regular run of the mill daily moisturizer. They are meant to treat facial concerns such as redness, dark spots, fine lines, wrinkles, dehydration, dullness, and the like. Most are on the thicker side- but are a liquid formula- and their formulas include powerful antioxidants and vitamins. Serums also come in specific facial features- meaning they make one for all over the face and ones that are just for the under eye area. Serums also come in natural and cruelty free formulas, depending on the brand. Serums are meant to be added to your daily skin routine- but some can also be used as a standalone product at night (ie. dr. brandt® glow by dr. brandt® overnight resurfacing serum). Of course if using a toner irritates your skin, then skip it. The main thing is to add the serum to your face before moisturizing. Serums are able to penetrate the deeper layers of skin that your regular moisturizer is unable to. Honestly, you can buy serums almost anywhere nowadays. And they really aren't that expensive. Target has a nice array of eye and face serums to fit every budget, as do Birchbox, Sephora, and Ulta. And I'm relatively sure Walgreens, Amazon, and Walmart do too. There are so many serums on the market today, and it's really hard to decide which one is for you, especially if you are wanting to pay a pretty penny for a good one. First, you need to figure out what serum you are looking for- face, eyes, all over, or both. If you don't know, it's ok- you are probably just wanting a general- all over- serum then. Second, you need to figure out what you are trying to correct. Do you suffer from redness, fine lines, dark spots, etc. and want to correct that? Since some serums are facial ailment specific, it helps to know. But don't worry- there is a good amount of serums out there that actually do everything. Third, I would recommend that you make a trip to Sephora and try some serum samples out. Most of the customer service ladies should know their serums/face products, so ask them questions- they can point you int he right direction. And you can try up to three samples on each visit- just tell them you are in the market for a serum and need to find the right one for you. I tried a sample, and didn't like it. I have rather sensitive skin, and the serum seemed to irritate it- my face was red and itchy for about thirty minutes. Plus, it smelled like orange, and I am not a fan of putting things that smell like citric fruit- orange, lemon, lime, etc- on my face. I tried a sample, and seriously loved this serum... but I DID NOT love the price tag. If it was cheaper, I would have bought it because it made my face feel smooth, calmed my redness, and I could see the dark spots under my eyes start to disappear. I just finished my bottle, and have an order in for another. Another sample- this time from a limited edition Birchbox. I really loved the feel of the serum, and felt that it really did brighten my face. However, I did use it in conjunction with a charcoal cleanser. I had received the product free for a review, and hated it. It seemed to burn my face (most likely due to the retinol) and break it out. You can view my full review here. I'm not going to lie, I really liked this serum. I received the product free for a review, and you can read my full review here. So I would highly recommend the Marcelle serum, but that is just my personal preference. If you are on a budget, would like to try out a serum, and just don't have the money, go to Sephora and try out their samples. I will be trying out more drugstore serums in the near future, so once I do, I will give you my full review. If so, which do you recommend? If not, have you ever tried a serum? Love this post! 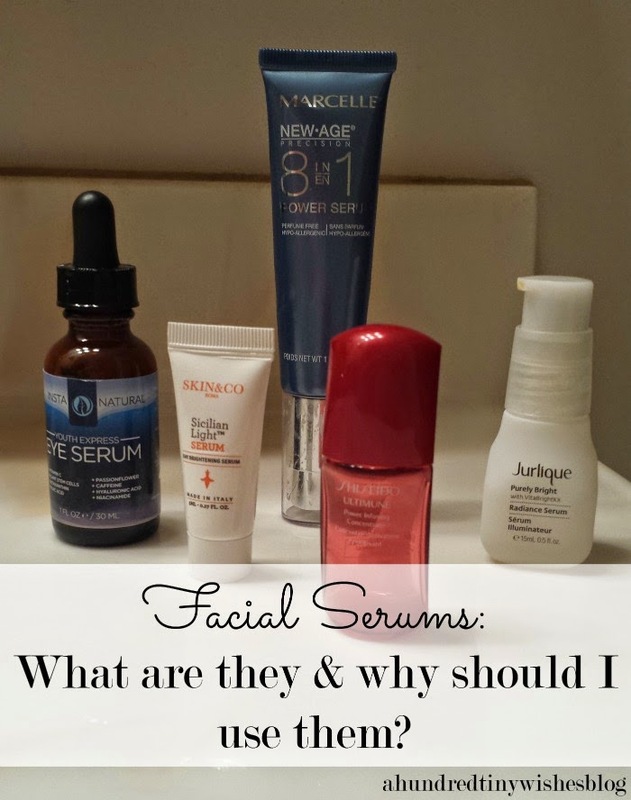 Never knew a lot about facial serums before, but now I'm interested in checking them out! Thanks, girlie! :) That makes me smile! I love serums! You are so welcome hun! A reader had asked me about them, and I figured they would make a great post!